Meanwhile Tim Smith checked in with the first half of his report. I arrived in Toronto early Saturday morning and spent fifteen hours over the weekend navigating the vast open spaces separating the four detached and subdivided exhibition areas at TAVES. The Toronto Sheraton sits sprawling in the centre of the city, its floor plan chaotic, without order and poorly insulated corridors. There was widespread frustration in the face of elevators that never came up from below. That of course is the Sheraton’s fault, not TAVES’. Attendees heard the city’s restless drone and the exhibitors’ music in equal measure. Commuting time between exhibition areas was significant. I understand the rationale for seeking the bigger pastures of the Sheraton Hotel this year. At 111 years old, the King Edward Hotel is tired and cramped with just 300 rooms. Its loading bay was apparently less than ideal for last year’s exhibitors. I cannot imagine the amount of work that must go into organizing such a big event. Like many others, I appreciate the hard work of TAVES’ organizers. Better to have a new show in Toronto with a few hiccups than no show at all. Overall, most people were happy and it was a success. But the new hotel’s layout meant that some rooms, in particular those tucked away off the beaten path like the wonderful Cyrus Audio/Monitor Audio room, probably were short-changed through no fault of their own by low traffic. TAVES’ move from the august King Edward purchased breathing space at the expense of cohesiveness, like moving from the piazza with spokes running off in all directions to the square-shaped strip mall with a barren no-man’s land in the middle. At Montreal’s SSI, hosted at the Hilton Hotel earlier this year, one regularly came across the same people several times a day, since that show was arranged in a relatively compact area and most traffic flowed through a central node. It was the complete opposite at the Sheraton. As arranged in advance, I met up with veteran moonie Glen Wagenknecht early on Saturday morning. I never saw Glen again even as he stayed for the duration of the show. The same goes for the day trippers who drove me to Toronto. We parted ways, temporarily we thought, on Saturday morning as I checked into the Sheraton with a ‘see you in the show,’ never to see one another again that day. The layout of TAVES worked against sociability. I was, however, delighted to bump into another moon unit, Mr. "Ten Listening Rooms" David Kan. I nearly walked past David without recognizing him because he was hiding behind Le Corbusier-style eyeglasses. We had struck up an e-relationship several years ago due to our love of single-ended 6L6 amps. So it was wonderful to meet the man—quite possibly one of the world’s best classical music reviewers--and speak for twenty minutes or so. It is largely on the basis of his glowing reviews of Elekit DIY amps that I am, as I write this, listening to the wonderful Elekit TU-8200 DX integrated amplifier which I brought back from Toronto fully assembled. 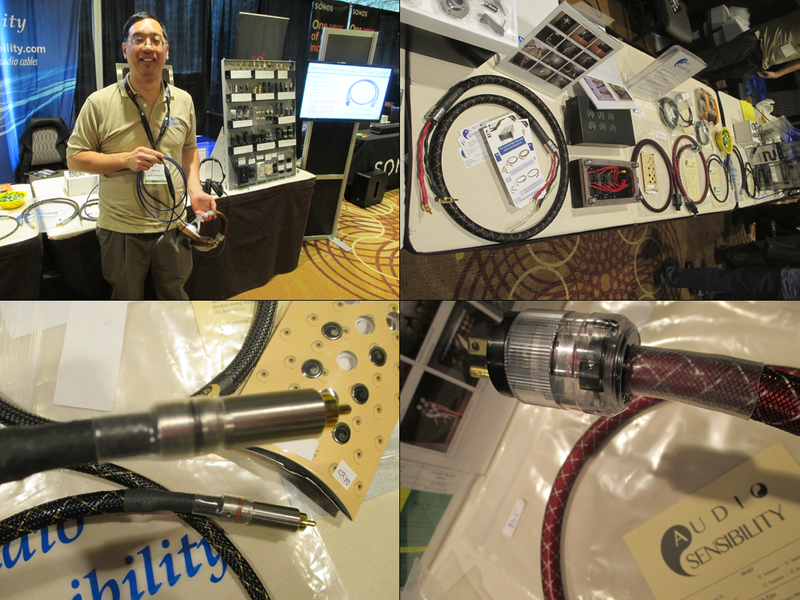 Once again, at TAVES Victor Kung of VK Music put on a dazzling demonstration of over a dozen DIY devices from DACs, portable head amps and speakers to integrated amps like the TU-8200 DX. The same should be said of Steven "The Giant Killer" Huang, owner of Audio Sensibility. Here is a straight shooter building world-class cables, power conditioners, adapters and interconnects at real-world prices. Behold the workmanship! You’ll never see a detached connector on any of his gear. And unlike many boutique cable companies, Steven keeps a good stock of gear on hand so wait times are non-existent or limited to just one week. On with the rooms. I visited each at least twice, including the ones I did not like, to give them a second chance and/or to confirm my first impression. The rooms I liked saw me return four or five times in order to get a sense of how the systems handled various types of music. My favourite rooms sounded wonderful each and every time I entered. In this preliminary report I will talk about these rooms in detail, with much more to come in my full report, including detailed specs of the gear mentioned below. My favourite in show, in no particular order, goes to three rooms. Notice I said ‘favourite,’ not ‘best.’ My idea of good sound is warm, musical, fluid, toe-tapping, without searing highs. I am willing to give up some detail if I get the warmth and tonality I crave. Others might prefer a different kind of sound. It’s no coincidence that almost all of my favourite systems featured tube amps. Although I have lived with and loved single-ended Class A transistor amps and currently own Class D amps and a Tripath chip amp, I am biased toward tubes. With that disclaimer, on with the show. First, I tip my hat to Audio Alliance, a Toronto-based distributor and owner of retail store Planet of Sound with branches in Ottawa and Toronto. 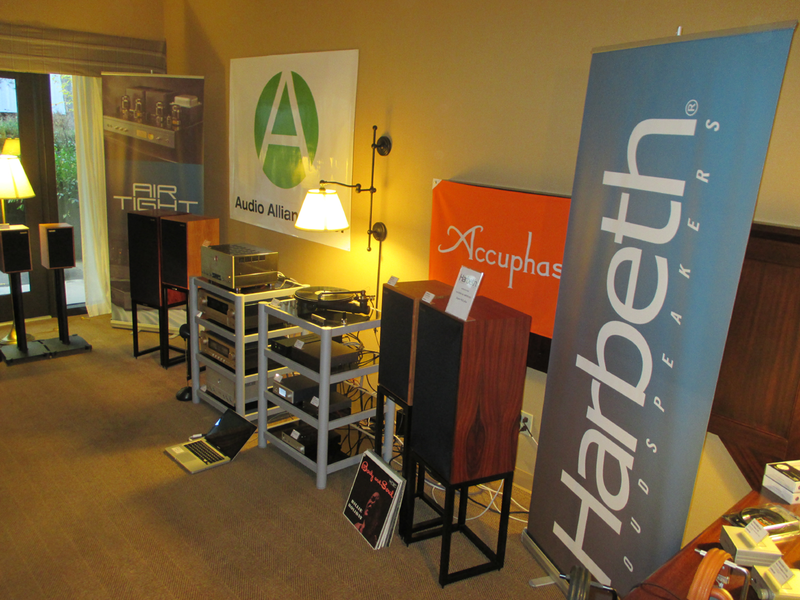 I own Compact 7s and love the Harbeth sound but I think I can state objectively that the new and improved Harbeth Super HL5 ‘Plus’ loudspeaker was one of the most smooth, coherent and musical speakers at TAVES. It didn’t matter if the HL5 Plus was fed with a Kuzma/Ortofon/Whest analog front end or with a Weiss 202 DAC. It didn’t matter if amplification was Class A/B by Accuphase or push/pull 6L6 by Air Tight. Every track was hypnotic, narcotic. There was nothing ‘hifi’ about the sound. With several Analogue Productions LPs spinning classic jazz from the late 50s, I felt like in front of Benny Golson in 2011 at the tiny Duc des Lombards club in Paris, a venue that somehow manages to pull off great sound in a cramped and seemingly hostile sonic environment. Like the other great setups, the Harbeth room never offended, never sounded clinical or shrill and was always smooth and musical. The Super HL5 imaged spectacularly. Five feet from the sweet spot, itself quite close to nearfield conditions, I had no sense of listening to just one speaker. Ella and Louis were in the room. Harbeths have always been popular with lovers of vocals, acoustic guitar, jazz trio and chamber music. But the Super HL5 Plus is no slouch where techno and electronica are concerned. They are almost full-range, digging as low as 32Hz. And they are fast. I visited this room at least five times. The last time I checked in, Gunnar van Vliet, the peripatetic owner of Audio Alliance, was checking out and boxing up on Sunday evening. At my request, he turned some techno to 11. No need to worry about the neighbours. It was closing time. And no need to crave six-figured over-engineered-for-the-sake-of-over-engineering 250 kilo behemoths milled from a solid piece of ‘aircraft-grade’ aluminium, especially when a 20kg $6'300 speaker performs better. Harbeth proves time and again that less is more and one need not reinvent the wheel with exotic enclosures polished with snake oil to achieve sublime sound. Like Naim, Harbeth do not introduce new models with every fashion season. They do so when they have something new to say. In this case, a new crossover and woofer deliver an almost perfect frequency response from top to bottom. The result is seamless sound, cohesive, smooth and sweet. These Harbeths do all musical genres well. Harbeth cabinets are made with thin but high-quality wood. Yes they resonate and you can feel small vibrations on the enclosure while music plays just like real musical instruments vibrate when you play them! Maybe that’s why their tone is so sweet and lifelike? The Supers were placed along the long wall, with the listening area 10 feet or 3 meters away. With the Super HL5+ I felt as though I were standing at the base of the Hilary Step, exhilarated. Having come so close to perfection, do I stop or do I throw caution to the wind and go for the summit, the $12'999 Harbeth Monitor 40.1? Today my reserves have run dry and I have to turn back but I know that one day, I’m going to go for it, finances be damned. The Coup de Foudre room was equally musical. Graeme Humfrey and Jennifer Cytrynbaum of CdF were on hand to showcase several products that punch well above their weight. Coup de Foudre is a major Montreal retailer and Canada’s leading source for Shindo, Leben, Line Magnetic and other premier brands. This room featured the Line Magnetic LM 755i field-coil speakers ($8'995 including separate 300B-based power supplies to power the speaker magnets). These gorgeously crafted loudspeakers owe their pedigree to vintage Western Electric cabinets and the venerable WE 755A drivers but the LMs use a field coil, not alnico magnets. CdF drove these eminently musical transducers with the versatile Line Magnetic 518IA integrated amplifier which I own. They played some of the best music of the show in their small room, mostly blues and jazz. Again you can see my preference for wooden not aluminium boxes that breathe like real instruments. The LM speakers are big but they weigh only about 65 pounds. Vinyl spun for the most part using a Clearaudio Innovation Compact turntable with an EMT cartridge and Leben phono preamp. When Humfrey played CDs, he used a Luxman player. Sometimes the music was played at moderate levels and sometimes it was quite loud but the musicality level never dropped. In fact, I felt a much stronger attachment when the occasional attendee asked for the volume to be turned up. The LM single drivers are smooth and coherent and sounded far better than any other such speaker at TAVES. They kept their composure when pushed hard. One of the marks of a successful room is the length of time listeners stay seated. If they get up mid-song and leave, that’s usually a bad sign. The LM speakers took hold of many a listener and refused to let go for many a song. An entire side of an LP was a typical session for many, including myself. 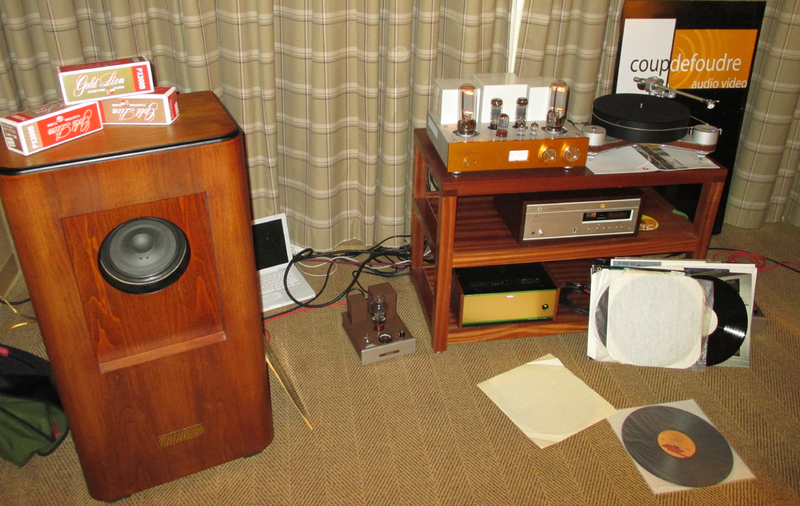 The sound was very much like the Harbeth room - sweet, round, full, with a pulsing beat. Toe-tapping fatigue-free musicality it was but with all the power and dynamic swings one could hope for. A large full soundstage with no congestion. The Line Magnetic amplifier using the 845 output tube can shock those who have not been forewarned. It is one sweet but dynamic beast, capable of waking up the neighbours. And it can help to achieve the full Copperfield Effect as the speakers disappear magically and put nothing but music free of hifi artifice before your ears. I have always wanted to like big Tannoys but have never quite ‘gotten’ the sound, perhaps because I have never heard them in a large enough room. I made an immediate connection with the Line Magnetic LM 755i powered by its stable mate amplifier. It’s the best of both worlds, power and finesse. This room never offended the senses and in fact it did nothing but slake my thirst for sweet aural ambrosia. 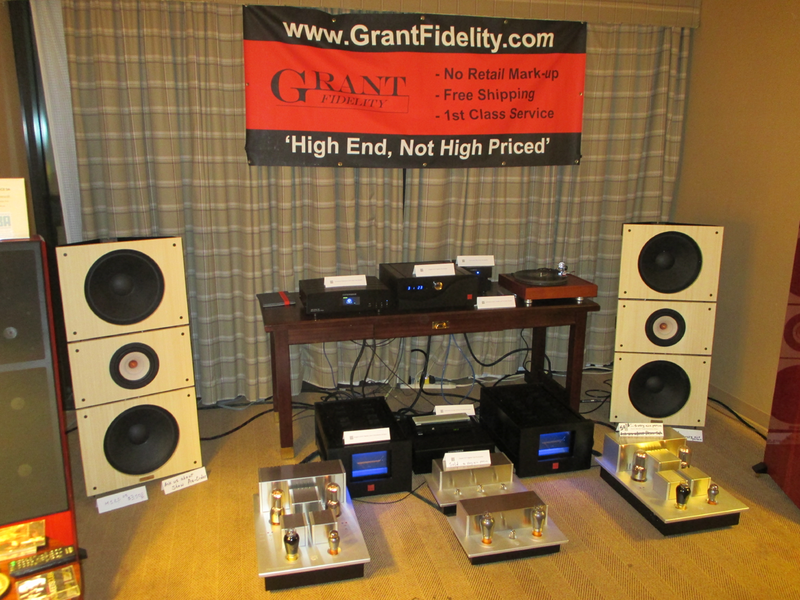 Grant Fidelity’s Ian Grant was admired and respected by audiophiles around North America and Europe too. His philosophy was simple: provide excellent sound with small markups. Import directly from China and spare the customer the pain of the middleman’s cut. Search the vast emporium of Hong Kong and mainland China for well-made goods, then commission a few products with a particular design philosophy and sonic signature in mind. Help those without deep pockets drink in the tonic of sonic bliss. Tragically, Ian passed away last summer but his partner, the ever-friendly Rachel Zhang, decided that the show must go on. With Rachel at the helm of Grant Fidelity, audiophiles will continue to enjoy some of the best bargains In the world like the tubed DAC-11 made to GF’s specs, the various Yulong and Matrix DACs on offer and of course the wonderful top-grade Psvane tubes she imports directly from Psvane. The Grant Fidelity website is also a portal into the products of Jungson, Consonance and other top Chinese manufacturers’ amplifier and DAC offerings. In Toronto, Rachel teamed up with a new speaker company based in Israel and Germany called PureAudioProject. 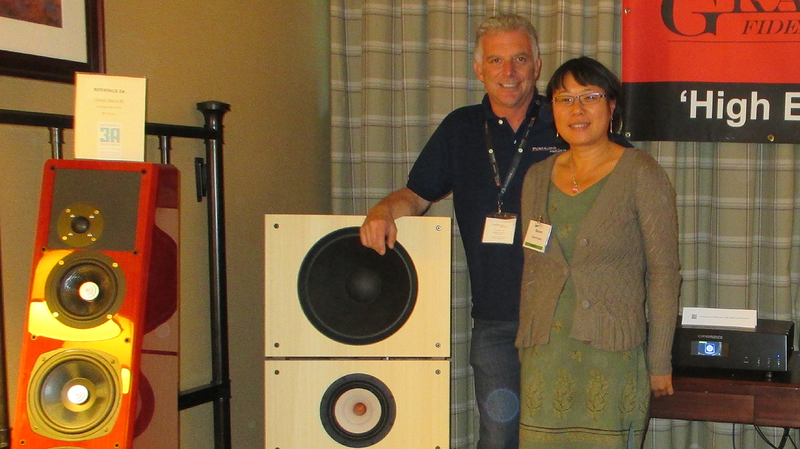 PAP’s designer Ze’ev Schlik brought his $3'500 Trio15 TB open baffle loudspeakers to Toronto. They were paired with Psvane’s flagship amps, the stunning T-845 Super Tube monoblocks with a Psvane preamp (total $12'500) and with a $2'000 Psvane KT88-based amplifier. This system was connected by the affable cable guy Moray James of Calgary with his giant-killer interconnects and cables of various sorts. The source was an old cheap but modified DVD player blessed with Moray’s gold dust touch. This sub $20'00 /sub $7'000 system (depending on which amp was used) put to shame several systems costing five to ten times as much. 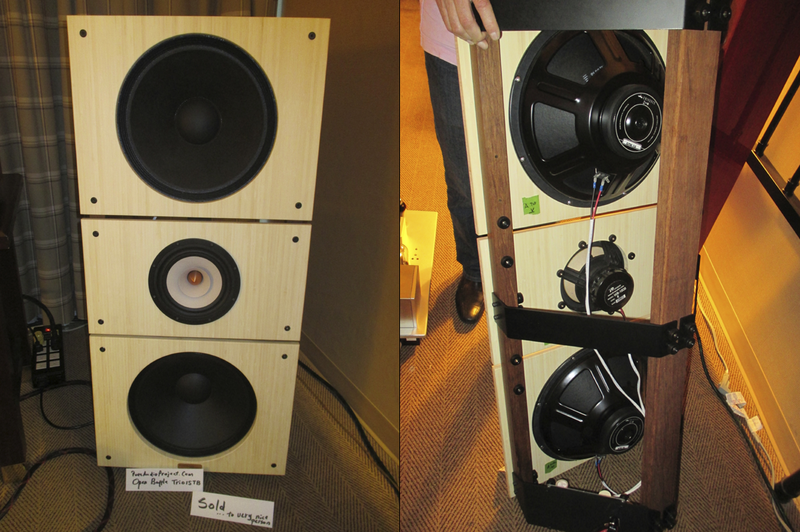 To my ears, PureAudioProject’s $3'500 speakers sounded more musical than almost every five-figured speaker at the show. Here’s what your 3.5 big ones buy: beautifully finished oak panels crafted in Germany and their braces. (Cheaper panels are also available.) A high-quality Mundorf-based (and assembled, if you wish) crossover. Two Eminence Alpha 15a drivers per speaker. One Tang Band W8-1808 eight-inch widebander per speaker. And you must contribute one to two hours of your time making very simple attachments, less complex than assembling an IKEA crib. The parts come from around the world and are gathered by a dealer on your behalf in your country (or close by), then shipped to you for assembly. This cuts down on shipping costs. If you wish to build your own panels, you can do that and save some money. You can order à la carte. To say that an open-baffle speaker sounds open is a cliché but true. Sometimes open is a euphemism for extended highs but a thin and anaemic midrange lacking tonal saturation. That’s not the case here. To explain the soundstage thrown by these speakers, let me start by describing what they do not sound like. Imagine that PRaTy sound you’d get with a Naim amp driving ProAc speakers. It’s the knockout blow of a mailed fist—crunchy, punchy and in your face. A flat-earther’s paradise. Now say goodbye to all that and imagine a room in which musical images emerge like a soft bulbous orb of sound that expands and contracts effortlessly, side to side, back to front, and up up and away like a musical balloon. These modestly priced Eminence drivers performed some kind of magic in tandem with the TangBand driver, which I have found to be bright in some applications. That’s not the case here. The PureAudioProject speakers created a smooth soothing musical wall of sound. 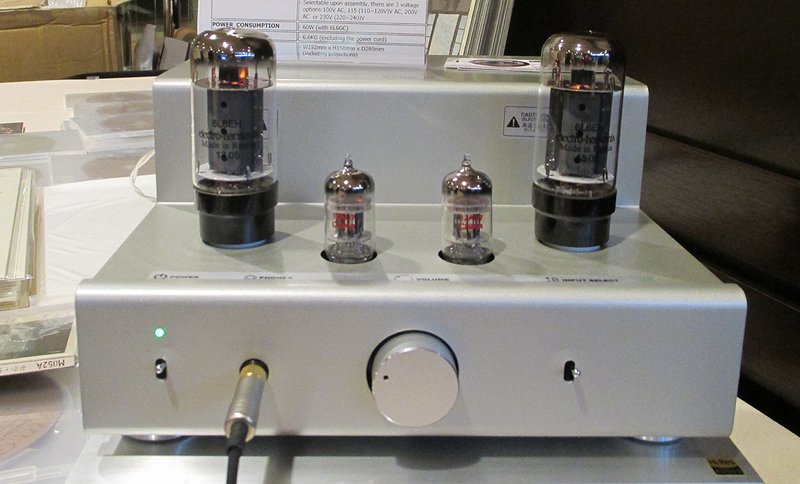 They had some help from the gorgeous Psvane monoblocks based on the 845 output tube. I considered pulling the trigger on these several months ago and now regret my hesitation. The Grant Fidelity/PureAudioProject room was characterized by deep bass which perhaps was not the most dry or articulate but certainly not bloated. The soundstage was large but realistic and the highs were a touch rolled off. Bill Frisell and Stevie Ray Vaughn’s guitars were super sweet the way I like it. Dynamics were startling fast. I said aloud, ‘who needs Maggies when you can have panel-like imaging with much better bass’? And Ze’ev Schlik said ‘you’d be surprised how many people have sold their Maggies to buy our speakers.’ Actually, I’m not at all surprised. The PureAudioProject speakers are 93dB sensitive. Just a few watts will do. Magnepan owners (that’s me) take note!